Shingles in progress – overlapping at the valley. The shed roof has a 4-on-12 pitch, instead of 12-on-12 like everything we’ve roofed up to this point. An advantage of the less steep pitch is that you can stand directly on it, with no need for roof jacks or cleats. 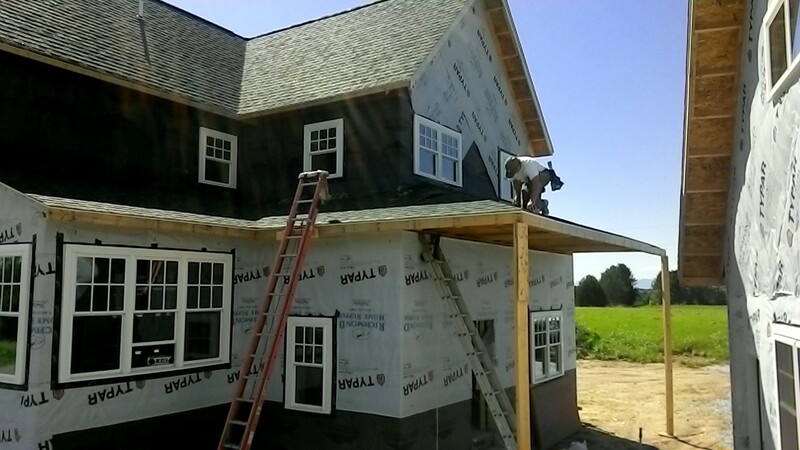 A disadvantage is that you have to bend way down to reach the shingles, which is tough on the back and ankles. Two types of roof angles. A valley is concave; a hip is convex. 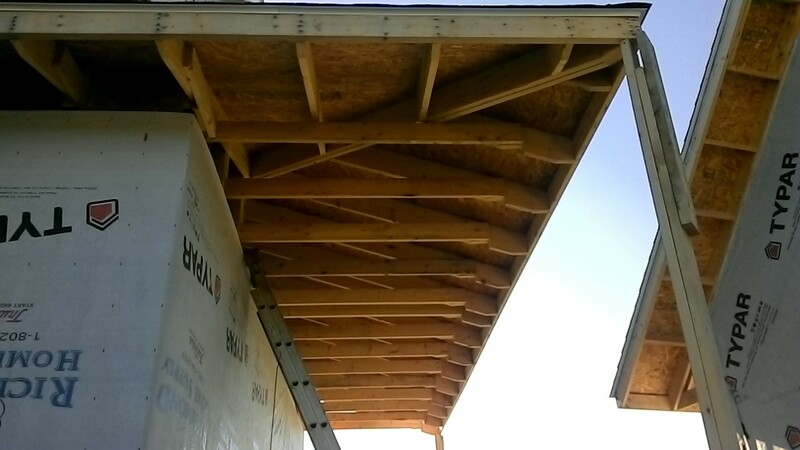 Thanks to the shape of this roof, wrapping around the house with a hip and a valley, Terry and I got away with using a whole shingle at the beginning of each row. No need to cut starters… we just varied our overlap at the hip to ensure the joints don’t line up. Terry periodically trimmed starter shingles in place so in the end they followed the hip exactly. We finished with cap shingles. 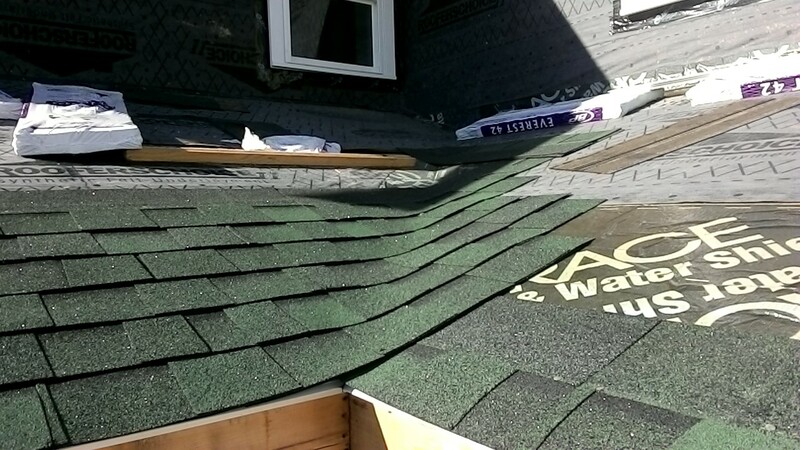 Terry installs cap shingles along the hip. Directly below us Colin made inroads on the shed-roof ceiling. This detail is pretty tricky, not only because of the varying rooflines and wall locations but also because access is very limited. 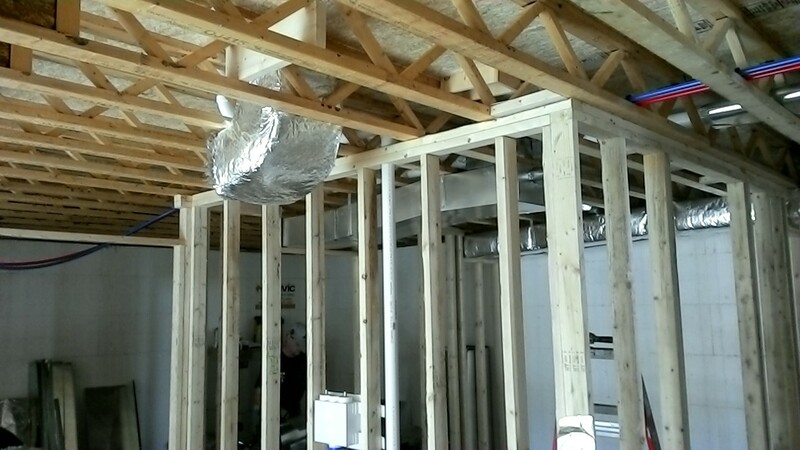 Colin’s additions included vertical members from the rafters down to the mudroom walls, horizontal ceiling joists from the walls out to the rafter tails, and nailer blocks to hold the assembly together every 2 feet. Framing progress under the shed roof. The plumbers continue to poke pipes and ducts through seemingly every wall cavity in the house. 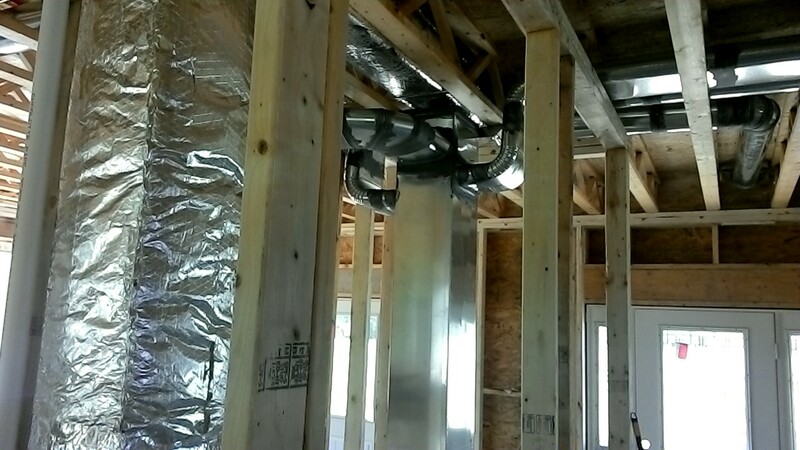 An “out” and “return” duct now connect every occupiable space to the mechanical room, and at least three water pipes – red for hot, blue for cold, and white for the drain – lead into each bathroom and the kitchen. Downstairs the utilities run below the floor trusses rather than through them. Colin is considering whether he wants a false ceiling to hide this ductwork, and if so, whether we can take out some of the plumbing floors for a comfortable ceiling height. Just another of the gazillion decisions he must make as a self-contracting homeowner. Ducts and plumbing lead back to the basement’s increasingly-well-named mechanical room.